Leave the spaghetti on their plate! We’re sure we don’t have to tell you children make a mess, but definitely don’t let them make a mess with cables. 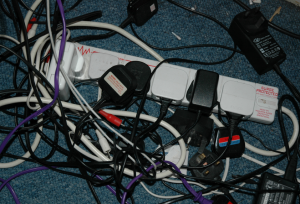 Aside creating tangle central, cable spaghetti is also incredibly dangerous as tangled cables pose a potential fire hazard. And the same goes for trailing cables, not only can they be a trip hazard, they are also more likely to become damaged and have their live wires exposed. To remedy these two problems we suggest investing in cable tidies or trunking for your child’s bedroom, they won’t just make it look less messy, they’ll also keep the cables out the way and reduce the danger. …or even better get them into the habit of switching it off. Whether it’s a computer, a games console, a TV, a stereo, a hair drier or even worse hair straighteners, make sure it’s switched off and unplugged when not being used. Switching off and unplugging these devices off won’t just save you money on your electricity bill it will also put a stop to the risk of an electrical fire. Water and electricity don’t mix and then again neither do kids and drinks! Put a stop to spillages and say no to drinks in the bedroom. Water (squash, juice, lemonade) and electricity are a lethal combination, so much so that a drinks spillage over an electrical device spells danger. We know your child is probably itching to get back on that games console after they’ve had a bath or shower but as was said above, water and electricity are a lethal combination! It’s a simple one but ensure they’ve properly dried off before they start touching games consoles, TVs, stereos and other electrical devices! Be aware of what your child is using to charge their phone, tablet laptop or other such devices. Encourage them to use the correct charger for the correct device, there are many poor standard chargers available at market stalls and on the internet, many of these are a potential fire and shock hazard. Take advantage of the great information from the Electrical Safety Council click on the link below.